A recent town hall, held by the Orange County Training School Lincoln Northside Alumni Association, highlighted the complex racial history of Chapel Hill-Carrboro City Schools. Before 1967, Chapel Hill High School was located downtown on Franklin Street. Today when people stand where the school once was and look across the street, they see the storefront of an Aveda hair salon. Students at Chapel Hill High peering out their classroom windows half a century ago saw the front doors to Belk’s Department Store, complete with separate white and colored entrances. 2017 marks the ten year anniversary of the opening of Carrboro High. But it also marks the 50th anniversary of the first desegregated class to graduate from Chapel Hill High School. Chapel Hill High opened doors at its original downtown location in 1916, only enrolling white students until fifty years later. The first African-American high school in the area was established in 1924 in the build- ing now known as Lincoln Center. The school was called the Orange County Training School but was renamed Lincoln High in 1949. Brown v. Board of Education ruled segregated public schools unconstitutional in 1954. 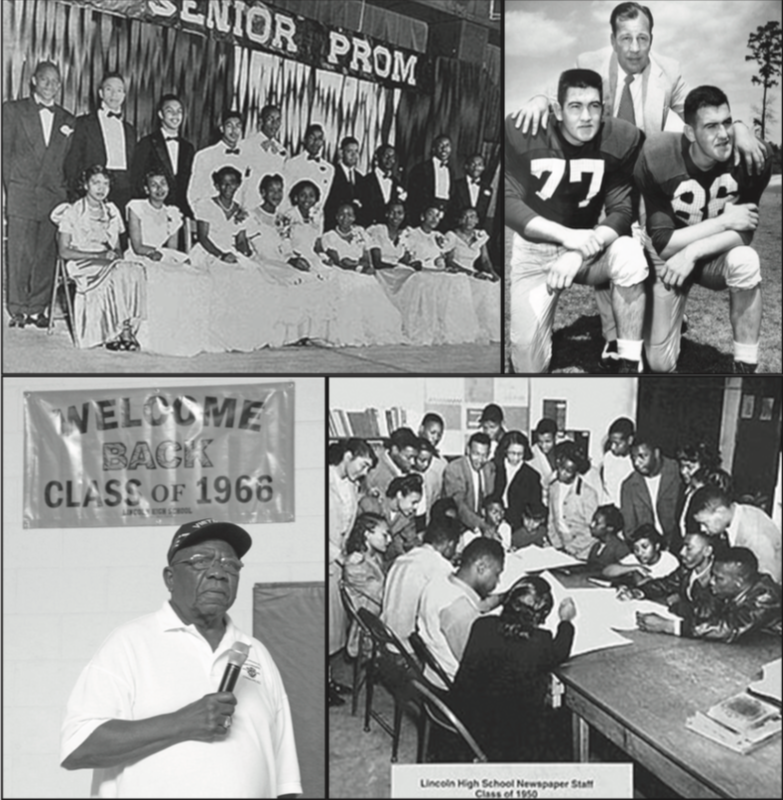 In 1963, students at Lincoln High were allowed to transfer to Chapel Hill High, but the vast majority opted to stay. The two schools combined elements of their respective school’s heritage: CHHS brought their colors to CHHS, black and gold, and Lincoln High brought their mascot, a tiger. At the town hall held in October, panelists recounted the history of their school and the process of desegregation. The panelists included former students and teachers. Many explained that while integration was a victory for students of all races, those at Lincoln were sad to see their school close. They were proud of their teachers, their sports teams, their band and the community they had built. And while some of these things transferred over to their new school, it still felt like a loss in many ways, at least for those first few years. Alice Page Battle is a member of the Lincoln High class of 1951, where she returned in 1955 to teach until 1966. After integration, she taught for 25 more years. The local school board didn’t force integration until 1966. That year, both segregated high schools were shut down. Students from Lincoln High and the old Chapel Hill High transferred to a newly constructed Chapel Hill High School fur- ther out of town, which still operates at its current location today. Battle said that she has a lot of fond memories from CHHS, including the chance to teach James Taylor, but she remembers the bad as well as the good. She recalled white parents questioning the grades she gave their children, at one point culminating in angry phone calls to her house at night. She also remembers them challenging her teaching qualification, which resulted in her being switched last minute from teaching English to French. Stanley Vickers, who was one of a handful of African-American students to attend Chapel Hill High pre-integration, remarked on the school supplies he had access to at CHHS for the first time as a student. The history of Lincoln High is a major part of the history of Chapel Hill-Carrboro as a whole, yet it is often not emphasized in school curriculum. Moreover, this history still relates to the district. When considering racial issues like the achievement gap, many don’t realize that these issues have roots that go at least as far back as desegregation. Carolyn Daniels, who graduated from Chapel Hill High’s first integrated class, said that students from Lincoln were either discouraged from taking AP classes, or were unqualified because the prerequisites they needed weren’t offered at their old school. Julie Kemper, a teacher at Estes Hill Elementary, remarked how she still sees the qualifications of African American teachers questioned disproportionate- ly more than those of white teachers. Kemper’s comments, and the event itself, come at a time when equity and social justice are key concerns in public schools. The panelists’ perspectives emphasize the value of understanding the past, even as the district reaches toward the future.